Before the introduction of synthetics in the 1920s, Birch and Wintergreen were considered the best essential oils for the treatment of pain. The Native Americans used them to combat pain long before records were even kept! Birch and wintergreen are the best sources of naturally occurring methyl salicylate so that methyl salicylate (commonly used in liniments) is actually called oil of wintergreen. It is documented that these oils have cortisone-like effects that can relieve pain quickly. Peppermint Essential Oil is also very good in treating pain as a 1994 study showed that it was effective in blocking the transmission of pain signals. Essential Oils Best for Muscle Pain: Sweet Birch, Roman Chamomile, Lavender, Majoram, Peppermint, Rosemary, Thyme, Wintergreen, Ginger, Lemongrass & Eucalyptus. Essential Oil Best for Joint Pain: Sweet Birch, Roman Chamomile, Peppermint, Wintergreen, Lavender, Rosemary, Spruce Pine, Nutmeg and Eucalyptus. 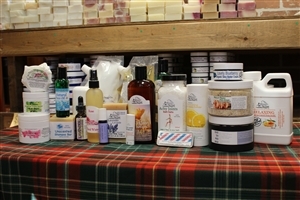 Here at the Great Canadian Soap Co. we have incorporated many of these essential oils into our products in order to make 100% Natural Pain Relief available to you! No fragrances added, just real honey and real cream! Honey is added for its calm, relaxing and balancing properties. New for Spring 2019! Geranium, sandalwood, and rose combine for a relaxing and balancing fragrance. 98% Natural. Unscented, Just pure natural ingredients. Great for sensitive skin as there are no fragrances or essential oils added. Rosemary and Lavender are a classic pairing. As the lavender soothes and refreshes, the rosemary gently stimulates. Our Achy Joints line is one of our most popular! The combination of Rosemary and Lavender is incredibly soothing, and now comes in our refill bottle! 100% Natural. Our refill bottles fill our pump bottles twice! Unscented with Oats has no added fragrance. Our luxurious Shampoo Bars now come unscented, too! Easy on your hair and scalp, this shampoo cleans gently and thoroughly. Some people have told us they will never use other shampoos again! 100% natural, Psorecz™ was developed with specific ingredients known to help moisturizedry skin and has proven AMAZINGLY effective even for more severe or chronic cases! 100% natural, Psorecz™ was developed with specific ingredients known to help moisturize dry skin and has proven AMAZINGLY effective even for more severe or chronic cases! The Psorecz™ oil is brand new in December 2017 but the formula definitely is not. Our 100% natural, Psorecz™ body butters were developed with specific ingredients known to help moisturize dry skin and has proven AMAZINGLY effective even for more severe or chronic cases! Without a doubt, our Psorecz™ body butter is our number one product for people needing deep moisturizing since 2012. If you love the outdoors but not its flying biting denizens, this shampoo is for you. Made with the same essential oil combination as our Bite Me Not Herbal Oil, it encourages the bugs to congregate elsewhere while gently cleansing your hair, leaving it soft and shiny. The scent is a woodsy, sonewhat nutty, earthy herbal aroma that is generally pleasing to everyone except the bugs! makes application quick and easy! 100% Natural. Psorecz Duo - two convenient sizes! One convenient price! 100% natural, Psorecz™ was developed with specific ingredients known to help moisturize dry skin and has proven AMAZINGLY effective even for more severe or chronic cases! Unscented. Now 100% Natural and Organic, this excellent moisturizing butter has no fragrance added! Great for those who are have sensitive skin or need a fragrance free moisturizer for the workplace! Ooh, those achy joints! Soothe the pain and discomfort while simultaneously moisturizing and protecting your skin. Winter is the season for dry skin, especially your face which is exposed to the elements. Our new Winter Face Bundle is formulated to moisturize and sooth. All of the products included are designed to fight dry, itchy, flaking skin. This amazing bundle includes Facial and Body Mineral Mud, Sugar Lip Scrub, Toning Mist, and a Winter Face Oil. New for the summer of 2016 this small misters became very popular. The oils in them are great for the face and hair. Combination of Argan Oil, Camellia Seed Carrier Oil, Marula Carrier Oil and Abyssinian Carrier Oil. Argan Oil Is grown in North Africa and the oil is produced from the kernels of the endemic Argan tree, The oil is valued for its nutritive, cosmetic and numerous medicinal properties. It is rich in vitamin E, carotenes, antioxidants and fatty acids, it is an ingredient in anti ageing creams. Argan oil is used to nourish the hair making it shiny and healthy looking. Camellia Seed Carrier Oil Amazing oil for the face and hair. This oil help skin recover from environmental factors, helps to refine mature skin and hydrates the complexion. One of the best kept secrets in the cosmetic and hair care industry. Marula Carrier Oil Is rich in antioxidant and essential fatty acids, this oil has been found to significantly improve skin hydration, softness and smoothness.Marla oil has excellent oxidative stability, which makes it an ideal choice for a leave-in hair treatment and scalp conditioner. Abyssinian Carrier Oil This is a seed oil which is naturally high in erucic acid, up to 58% and is used as a replacement for Argan Oil, with whic it shares excellent properties for the strengthening, gloss and manageability of hair, and the rehydration and protection of dry skin. This fantastic serum contains only pure Pomegranate Seed Oil and pure Hemp Seed Oil. No additives, no fillers. Pomegranate Seed Oil contains the highest levels of polyphenols (powerful anti-oxidants which work primarily on the skin), regenerates skin cells, and promotes the production of collagen and elastin. Hemp Seed Oil is made up of 80% Essential Fatty Acids, the highest amount of any plant, and not only provides an excellent moisture barrier but also increases the EFA levels in your skin resulting in a more youthful appearance. Youth AND wisdom, what could be better! Comes in an easy to to apply roll-on vial. A Hand Butter with the healing combination of Lavender and Geranium and Clary Sage Essential Oils. Natural healing care for cuticles and fingertips or any minor cuts & scrapes after a day of working with your hands! A healing hand butter formulated specifically for your hands, cuticles, and cracked fingertips. Absolutely pure and natural, this premium cream contains only Mango, Shea and Cocoa butters with Jojoba Oil. Essential oils of Peppermint, Wintergreen and Eucalyptus help relax and relieve tired, sore muscles, while the bath salts nourish and soften your skin, replace depleted minerals and remove toxins. Comes in a clear tube measure approximately 1" x 8". Salts are coloured red, green, white, and possibly other festive colours as available. When the great outdoors calls you with the sounds of buzzing biting insects, this shampoo is just the thing! Made with the same essential oil combination as our Great Outdoors Herbal Oil, it leaves your hair soft and shiny and discourages those flying annoyances. The scent is pleasantly herbal and bright, generally pleasing to all but the bugs! This amazing butter helps relax tense, sore muscles while softening the skin. Discourage insects and soften your skin at the same time! This 100% Natural Sun Cream has no scent added. This 100% Natural Sun Cream has no scent added.. The essential oils target those stiff, achy joints, while the salts help relieve bruises and sprained/strained muscles and joints, treat and soften your skin, and remove toxins. Soft your skin and remove toxins with our combination of Dead Sea, Epsom, and Dendritic Salts while our blend of Birch Sweet, Peppermint, and Wintergreen Essential Oils do their best for your pain.